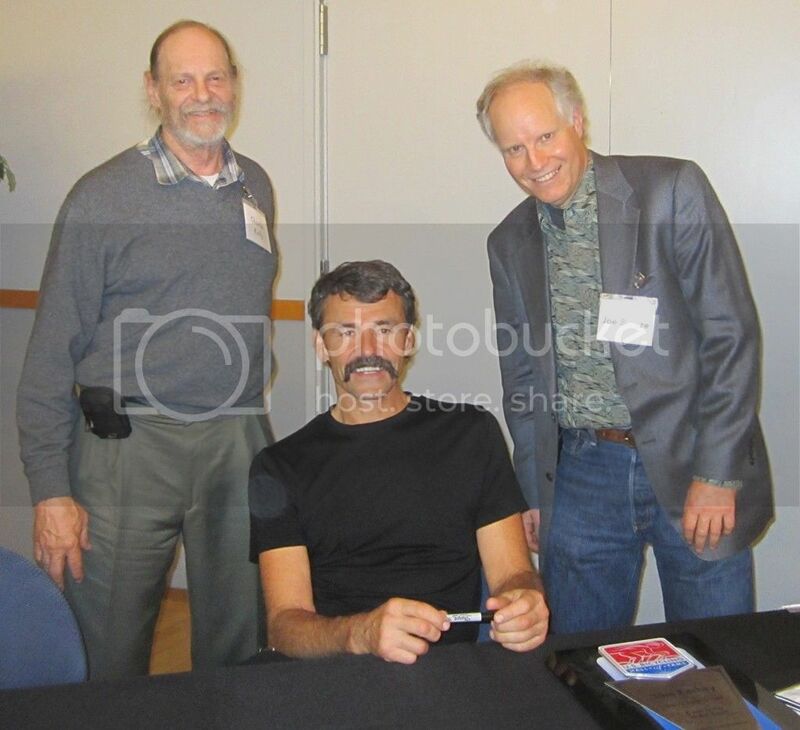 On November 3 Joe Breeze and I trekked an hour up the road to Davis for the annual USBHoF induction dinner. A couple of our friends were being honored, and Joe was bringing a couple of bikes up for the museum display. The bikes were one of the ten original "Breezer" bikes that changed bicycling forever, and a tandem made by Tom Ritchey in 1978 for a coast-to-coast record attempt by Joe and his friend Otis Guy. 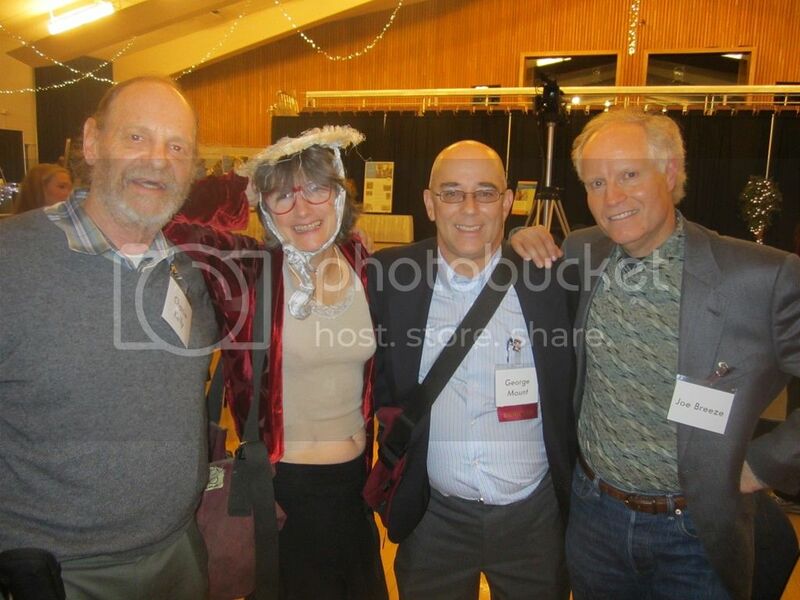 We first attended a symposium organized by Peter Rich, longtime owner of Velo-Sport in Berkeley. A panel of old racers discussed what racing was like in the '50s and '60s, when there were very few racers and fewer races for them to be in. Among the panelists were Peter Rich, Owen Mulholland, Ted Ernst, John Howard, and Tom Ritchey. Afterward we retired to the banquet hall, where those who paid spent $125 for the dinner, although Joe and I were comped. Since we didn't have a reserved table, we were told to take one of the "open" tables. First in the hall, we selected a couple of prime seats, and as we were enjoying our first glasses of wine, someone asked, "Hey Charlie, okay if I sit with you guys?" It was only John Howard, the cycling hero for anyone who took up racing in the '70s. Yer durn tootin' you can sit here. I felt honored to spend a couple of hours in conversation with a man who had been a distant hero so long ago. Since John was a multiple US road champion, an Olympian, first Iron Man winner, and holder of the bicycle land speed record (155 mph) I didn't have any problem finding stuff to talk about. Jacquie Phelan joined us also, and John seemed thrilled to sit with her, but I get to see her all the time since she lives in my town, and later she rode home with Joe and me. 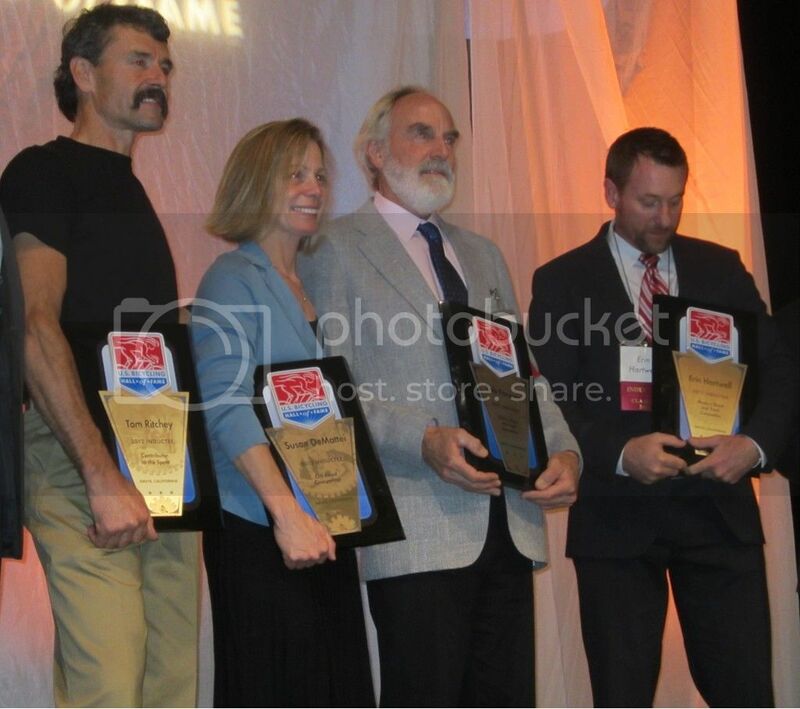 After dinner, the inductions, and our friends Tom Ritchey and Susan DeMattei were honored, along with old skool racer Rob Parsons (5-time Nevada City winner) and track rider Erin Hartwell. Tom was anointed for "Contributions to the Sport," Susan for being the first American Olympic medalist on a mountain bike. Afterward Joe and I posed with Tom. Gary Fisher wasn't there to complete the boxed set. Tom has not aged a minute in the 33 years since I met him. Jacquie and George Mount never saw a photo they didn't want to be in. Very cool pics! Thanks for posting them. You and your buddies kicked off a whole lotta fun for millions, so thanks for that, too. Wow - what a gang! Sounds like you guys had a blast. Location: The end of the road . . . Thanks for posting them . . . yeah, I've always thought Tom R. is kind of ageless, and from what I've read of Jacquie she is a real character--in a good way! Looks like a great time with some Old School cool. Man. I wish I could grow a handle like Tom! How about "helped American mountain biking develop" instead? There were 650b bikes being used on goat paths, etc in Europe before this. The evolution was happening in a few places so lets not overstate it. People rode bikes on dirt for a long time. The sport of mountain biking, however, came from Marin County, where a culture developed around it, and where more importantly, some guys decided to take the idea commercial so riders wouldn't have to build their own bikes. Follow any aspect of the modern sport upstream, and you will come to Joe. Howie won a lot of titles, and was a specimen too. But I am pretty sure there were 3-4 Ironman winners before he dove into the tri pool atmo. I would argue that while the industry of mountain biking may have began in Marin, the sport itself was going on in other places at the same time plus or minus a few years regardless of industry. I grew up in Houston and as early as '73 various bikes from 20" orange crates to 26" paper boys were being modified and ridden up and down the trails in the bayous around my area. It was small kids and big kids doing what would later be called BMX and MTB. I am sure others would have similar stories. Karl Benz may have invented the modern automobile, but Ricardo Montalban took it to a whole new level. This is the official car of the Mohels Of America Foundation atmo. Ya - he won it, I know. But the OP wrote that he was the first winner. There were at least three others before he showed up iirc atmo. I don't see Jacquie's white rat.